"Don't I look like a big boy now?" Yes,it is one of those true things about living that doing things the first time is usually uncomfortable. But what is also true is that doing new things is also exciting and brings about real growth. 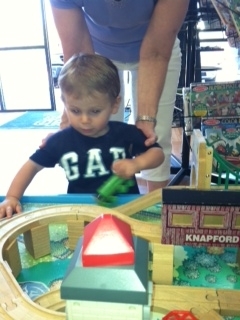 Here is little Ryan after his first real haircut at Little Locks in San Diego. So proud of himself about how cute he looks! But he was frightened at first! Whether you change the way you ask a patient to pay at the time of service, alter the way you do confirmation calls, talk to patients about treating their periodontal disease instead of continuing your “supervised neglect” by continuing with just a prophylaxis, or treatment plan crowns instead of redoing large fillings, it is bound to be a little scary. After you try the new communication technique and you see how well it was received, you will be amazed how easy it will become to do it again! You will smile all day!